If you love the idea of bunk rooms as much as I do, hop on over to Remodelista today to check out their photos. I especially like that they have accumulated a grouping of photos from around the world to see other country's takes on bunk rooms. Theirs are much simpler than ours. I think I'm drawn to bunk rooms because I love the idea of kids learning to coexist, share and sleep together (kind of like camp). 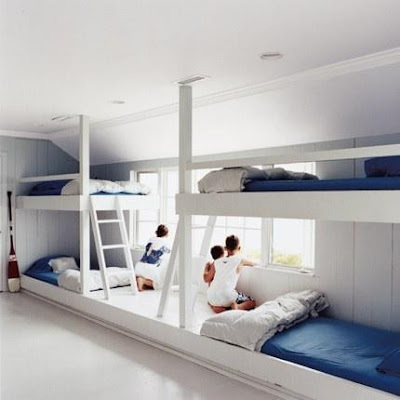 Plus having a space where they sleep and a separate space where they play is ideal. That way when they go into their bedroom they know it is time for storytime, nap and/or bed. LOVING these ideas. Our house might end up working for more kids than we originally thought after seeing some of these pics! Clever clever. There are so many great ideas there! 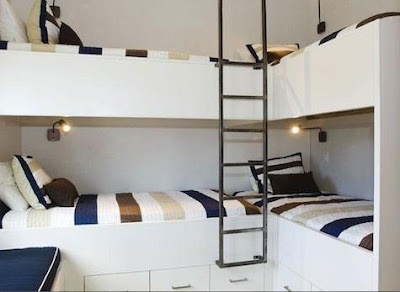 I went and had a look at their other post on bunks too! Thanks for introducing me to Remodelista!